We have started to see customers coming into the dealership with Floorplan Finder lists, and our sales staff are finding these lists very helpful. In a more mature world of internet marketing and website design most RV dealers in Canada now have fairly well-planned websites. One aspect that hasn’t changed much over the years is the way that vehicle inventory is searched. Most RV dealer websites have but one way to perform searches. The typical RV search form allows users to choose from parameters like RV type, price range, length, brand or model name, etc. But analytics reports show that a majority of RV consumers will enter the inventory pages by trailer type, like travel trailers, or fifth wheels, and then wander through pages and pages of inventory until they see a trailer that looks to fit their criteria. A frustrating and often dead end experience that forces the RV consumer to waste time and energy searching aimlessly. 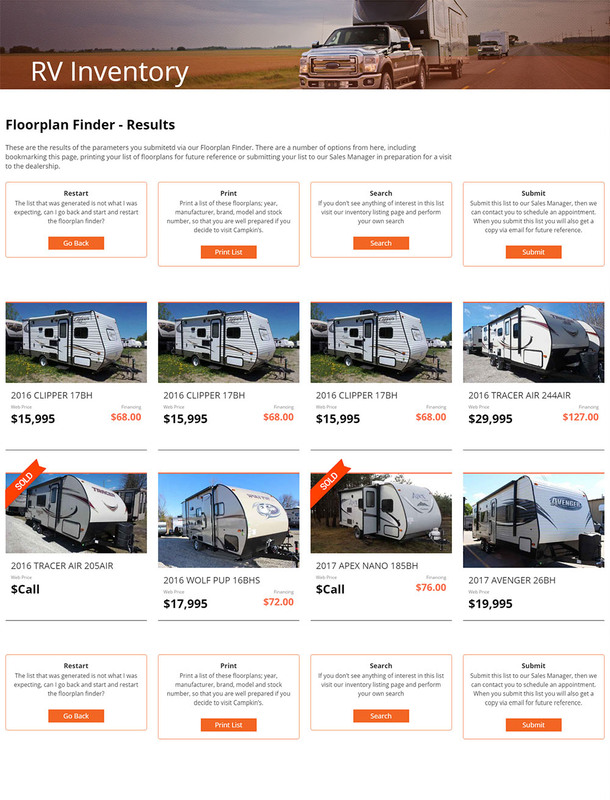 Campkin’s RV Centre, always innovating and never afraid of trying new ways to improve the consumer experience, has developed a way to intelligently search hundreds of RVs by asking a series of simple qualifying questions. 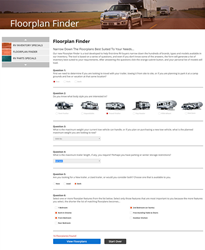 Named “The Floorplan Finder”, this application helps potential RV buyers, particularly first time buyers, narrow down hundreds of RVs so that they can more easily find the models that matches their needs. The questions are simple enough. “Do you want to tow your trailer from campsite to campsite or will you be parking it more permanently at one site?”, “Do you know what body style you are interested in?” or “Do you have a maximum weight your current tow vehicle can handle, or if you plan to purchase a new tow vehicle what is its planned maximum tow weight?” After a few more questions that pertain to length and whether you are looking for new or used choices, the final and most important question asks users to choose floorplan features that are important to their decision. Features include single bedroom, 2nd bedroom, bunk house, outdoor kitchen, front living room, rear bedroom, free-standing table and chairs, etc. Within two minutes of questions and answers users are presented with a number of models and brands fitting their requirements. The traditional inventory searches can often result in a message like "We're sorry, there are no trailers that fit your requirements." If a consumer is looking for something very particular and submits parameters like a low price range and a long trailer length, there may be nothing in inventory that matches, forcing the user to either resubmit their search and loosen parameters or look elsewhere. With the Campkin’s Floorplan Finder however, they have reduced the chances of empty returns by attaching a numeric feedback to each selection made from the floorplan features section. As the first option, say “2nd bedroom w/ bunks” is selected, the feedback may say “12 Floorplans Found”, and then if a second feature is selected, say “U-shaped dinette” that feedback might change to “4 Floorplans Found” and so on. This way the user is in control of the floorplans that are returned before moving on to the next step. Instant feedback such as this sets new levels of searchability and makes this Floorplan Finder very easy to use. Once there are a reasonable number of identified floorplans the user is asked to choose the View Floorplans button and the application presents the user with their list. This list can then be printed to bring in to the dealership on a visit, or submitted to the dealer’s sales manager via email so that they can be contacted for a sales appointment. These printed and submitted lists make new sales appointments more focused and help to quickly convey consumer needs to the sales staff. The feedback from users so far is positive, even though it was launched just two weeks ago. The number of users coming in with Floorplan Finder lists, although moderate, is increasing week after week and the percentage of sessions that include a visit to this new application is steadily rising. Always an early adopter, Campkin’s RV has a history of innovation with internet marketing trends and advertising best practices in an effort to present an informative and transparent shopping experience for RV enthusiasts across Ontario. “Our policy is transparency in pricing, the presentation of rich media so the customer can make educated decisions with the assistance a salesperson and, of course, great customer service after the sale” says Roland, the owner and President of Campkin’s RV Centre.